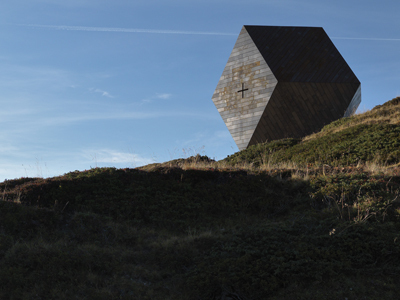 SIG Design & Technology Mario Botta’s Garnet Chapel at Penkenjoch – how is it Waterproofed? Notwithstanding the challenges of building at this high altitude on a remote site, this gem of a building also requires the best possible waterproofing. It was completed within three months in the summer of 2013, using the long-life high quality PIB membrane Rhepanol fk made by our partners FDT. On the exterior a series of perfectly aligned 300mm CorTen steel panels form a rainscreen with 10mm gaps. On the inside larch slats clad the surfaces, similarly spaced. Behind the finished surfaces a complex system of Binderholz cross-laminated timber (CLT) panels, spacers and additional steel reinforcement to support the weight of the CorTen, make this simplicity possible. At the core of the performance of the envelope is the waterproofing layer of Rhepanol fk that is applied direct to the CLT surface. Its impressive environmental profile including an ISO EN 14040-49 independent lifecyle assessment which shows that the material poses no significant environmental impact throughout its life from manufacture through to use and recycling. Although only 412 square metres of roof and façade needed waterproofing, this task turned out to be quite a challenge for the roofers. You can read about the process by downloading the Case Study on the Garnet Chapel or visiting the Case Study page. Here’s a slideshow of some of Enrico Cano’s fabulous photos of the Garnet Chapel – reproduced here with permission. Download a Case Study about the Garnet Chapel and its construction. Find out more about Rhepanol FK. Rhepanol fk is exclusively available in the UK from SIG Design & Technology and installed by our large network of trained and registered DATAC network of contractors. Read about the worlds oldest single ply roof, over 50 years and still going strong. Download the lifecycle assessment for Rhepanol FK, and access other downloads on the product here. Want to waterproof a challenging structure or use single ply in extreme conditions? Contact us about your project. We’ve got the experience and the expertise to help you choose the right membranes, and our design service is covered by our own PI Insurance. The Garnet Chapel featured in the January edition of DOMUS magazine.